Since May of 2012 I have managed to read all of Bette Lee Crosby's books except one. Although all of them were either good or great, her latest endeavor, Previously Loved Treasures, is perhaps my favorite. It is at least my second favorite, as I will always have a spot in my heart for Cracks in the Sidewalk. 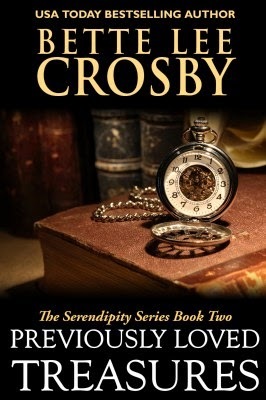 Previously Loved Treasures is the second book in Bette Lee Crosby's Serendipity Series. It is the story of Ida Sweetwater, whose husband and life long love, Big Jim Sweetwater, has recently died. Ida is left alone in their large empty house, which begins to weigh on her. Also weighing on her is her need for an income. At this point, Ida makes two decisions that kick off the book and set this heart-warming story in motion. It is also the story of her granddaughter, Caroline Sweetwater, and her need to find a family and a place to belong. The first important decision that Ida makes is to open up her home to boarders. This brings to the story a whole host of characters that not only enrich the story of her and Caroline, but also are interesting in their own right. This story would be nothing without this ragtag bunch of misfits and their interesting individual stories. In fact, you could actually say that each of these characters are previously "unloved" treasures that somehow find a home and a reason to be with the help of Ida and Caroline. I especially enjoyed the way that Bette allowed many of them a chapter told in their own words, interspersed among the regular chapters. Along with filling in details of the main story, these chapters really helped me get inside the minds of these characters. This lead to a greater understanding of their motives and thinking, and therefore, to a more enjoyable read. The second important decision is Ida's search for her long lost son, James, which ultimately brings her in contact with her granddaughter, Caroline. It is quickly apparent that Caroline is going to become the catalyst for the story that Previously Loved Treasures is trying to tell. It is Ida and Caroline's basic kindness that draw the characters in the story to them, and ultimately,allow those characters to repay them many times over with their love. And of course the story would be nothing without the Previously Loved Treasures second hand store and its charming proprietor, Peter Pennington. Peter is a bit of a mystery as a character, as is his ability to always know exactly what someone is looking for. Although I would recommend any and all of Bette Lee Crosby's work to everyone, this book would be close to the top of the list. Bette has a charming way of telling a story that both delights and engages. I am anxiously looking forward to reading the last book of hers that is sitting on my shelf, and to seeing what her next endeavor is.